Rosalie Ham is the author of The Dressmaker, which has sold over 200,000 copies in Australia and was made into a successful film starring Kate Winslett, Judy Davis, Liam Hemsworth and Hugo Weaving. Her second novel, Summer At Mount Hope, has all the originality and humour of its predecessor. It has been described as Pride and Prejudice set in rural Victoria in the 1890s. Phoeba Crupp lives with her squabbling family on a small vineyard in Victoria. At their mother’s urging, sister Lilith throws herself into trying to find a husband. Phoeba resists until circumstances force her to find her own way. Like The Dressmaker, this is a tale of big themes finding their expression in odd characters and small town life. 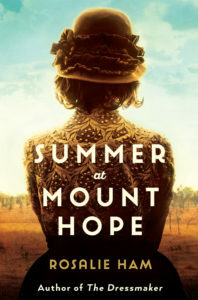 Summer At Mount Hope was originally published in 2005. Described as a ‘gifted storyteller’, Rosalie Ham uses the stereotype to subvert the cliché, always seeking to surprise the reader, and shedding new light on universal verities. Rosalie lives in Melbourne and, when she is not writing, teaches literature. She holds a BA in Education and a Master of Arts in Creative Writing.